During the mid-nineties, there was a certain musical performance from Ireland’s boy band Westlife broadcast live on Britain’s BBC TV, though it might also have been England’s boy band Take That. Difficult to say when they all seemed so interchangeable. The five teenage lads, whoever they were, gathered together around a piano, all dressed in white, looking heavenly and angelic as if they were about to sprout feathery wings while singing a slow, somewhat wimpy ballad of lost teenage love. The girls in the studio audience were screaming. Any writer watching this would have immediately felt that he or she was witnessing a genre of pop begging for theatrical parody. Whether the minds behind the off-Broadway musical comedy Altar Boyz ever observed that same performance we’ll never know, but it’s safe to assume that if it wasn’t that particular broadcast that inspired them, it had to be something similar. 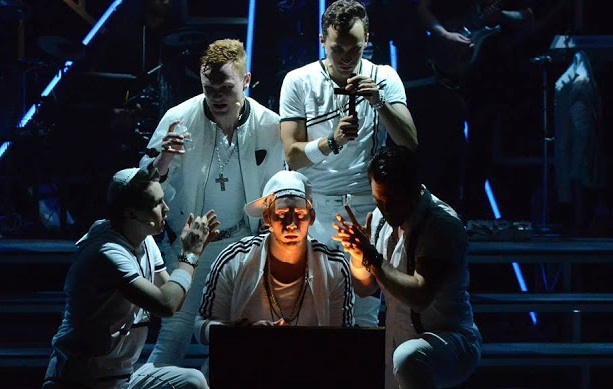 Altar Boyz, now playing at Arizona Broadway Theatre in Peoria until September 16, is a satirical look at the extraordinary success of the Boy Band. Of course, you could always say acts dating back to the sixties such as The Beatles or The Beach Boys were boy bands, but there’s a difference. The Fab Four wrote their own songs and played their own instruments, as did the Wilson Brothers and company. They were also called pop groups; the word band developed later. The boy bands of the nineties were not quite the same. They were (and still are) a harmonious vocal group of teenagers often formed not so much by artistic inspiration but for commercial purposes by record producers from auditions, not unlike the casting of a play. The performing lads were specially selected for their looks, their sound, and their overall chemistry in order to appeal to preteens and young adolescents, mostly girls. 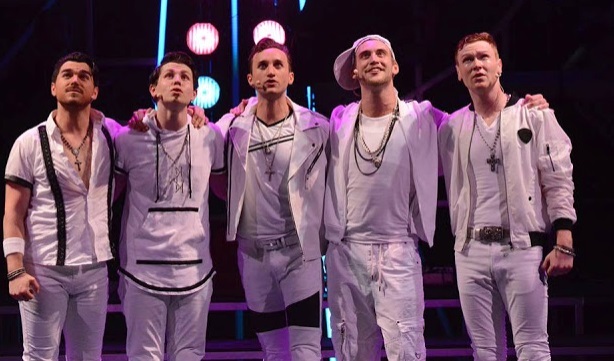 With names like Backstreet Boys, NSYNC, and Boyzone, the Boy Band phenomenon still has life. In fact, Boyzone, who formed in ‘93 then split in 2000, have since reformed. At the time of writing this review, the lads, no longer teenagers, have just released a new single. Writer Kevin Del Aguila has taken this idea, based on a theme from Marc Kessler and Ken Davenport, and turned it into something unexpectedly funny, though admittedly slim for a fully fledged theatrical musical. Performed in real time, the show we see is the final night performance of a national boy band concert tour. The five-member group called the Altar Boyz are on a mission. They’re Christians, Matthew, Mark, Luke, and Juan, plus one Jew, Abraham, all harmonizing faith-based themed pop/rock songs which they tell us they’ve sung in bingo halls and youth group gatherings all over the country. They’re on the tail end of their Raise the Praise tour – “Thank you Sony for the gift basket” – and now their closing night is in Peoria where they’re ready to croon and harmonize not only for teenage girls but to anyone who will listen. “God is where it’s at,” they sing. “We think He’s really phat.” They even have a mission. There’s a machine the boys have in their possession called the ‘Soul Sensor DX-12,’ a curious Ghostbuster-like device that displays the number of burdened souls sitting in the theatre. The five lads intend to reduce that number down to zero by the end of the show. The real fun of the show, however, are the songs and their performances from a five-member cast all sung by outstanding voices, presented with exhaustive, non-stop choreography by Lynzee 4Man who must have studied every move ever made by the real-life boy bands of the nineties and beyond, then found a way of incorporating all of them into the show. 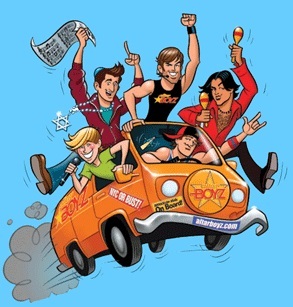 With catchy pop music performed by an excellent four-piece band that can be seen at all times on a raised platform up-stage, lead by music director Mark 4Man, plus witty lyrics from Gary Adler and Michael Patrick Walker, each number captures that essence of the type that makes boy bands popular. When Matthew (Joseph Depietro) performs in a soft, intimate manner Something About You to an unsuspecting member of the audience plucked from her chair near the foot of the stage, he sings, “Girl, you make me wanna wait.” And during Number 918, which could be subtitled The Exorcism Song, the boys produce their crucifixes and sing of getting the hell out of here, including the repeated refrain, “The power of Christ compels you.” But it’s Mark’s solo, Epiphany, that’s the most amusing where he tells us he used to be bullied by Episcopalian thugs, culminating with his musical declaration, “I am a Catholic!” faintly reminiscent of Elder Price’s “I am a Mormon,” complete with arm-waving, sing-a-long moves. 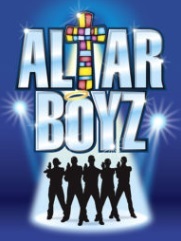 Traditionally presented as an uninterrupted one-act musical that runs for approximately 90 minutes, Altar Boyz at ABT not surprisingly has an intermission, stretching the production a further 20 minutes. This is, after all, a dinner theatre, and there’s always a little more coffee to drink, a dessert to enjoy, and a bill to settle. And while ABT’s dinner theatre main stage is a much larger forum than the one this small, off-Broadway show really requires, director Seth Tucker makes use of the extra space by spreading the practically non-stop musical numbers from stage left across to stage right. Though even with the high-energy of the cast as they bounce, skip, and, if you look close enough, twerk from one end of the stage to the other, the production still couldn’t escape the danger of occasionally being dwarfed by its surroundings. Final, though important word. Cast changes were made from the one presented in the program. While Tyler Gregory’s Luke, Joe Ogren’s Mark, Kirk Sobject’s Juan, and a pre-recorded Rob Watson as the voice of G.O.D. all remained as printed, Joseph Depietro has changed roles from Abraham to Matthew, making way for local valley talent, understudy Sam Primack to step in as Abraham. 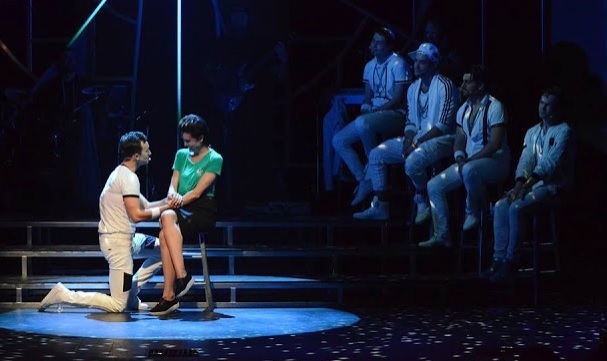 Despite the last minute amendments prior to opening, all five worked together as one with the sound and dance-move precision of a professional boy band that had long toured the bingo halls and youth group gatherings across the country together. Having seen Primack grow over the years with performances at both Valley Youth Theatre and Spotlight Youth Theatre, plus Desert Stages and even a previous outing at ABT, it was a pleasure to see him do so well, and to come so far, so quickly.